Read the story of the March 23 workshop here. Surely you’ve seen her. Every time Florida executes a prisoner—as it’s done six times in the last three years and will do so again on April 10—Jackie Morelewicz stands with her husband or a few others on State Road 100, in front of the Flagler County Courthouse, with signs protesting the death penalty. It’s a long-standing effort with a few distant local echoes. Father Phil Egitto, the pastor at Our Lady of Lourdes in Daytona Beach, takes a bus to Starke, the state prison and death chamber, every time an individual is put to death, and joins vigils there. Mark Elliott, a property manager, also joins the vigils and leads the Clearwater-based volunteer group called Floridians for Alternatives to the Death Penalty, advocating for life without parole rather than the death penalty, a move that would save the state $51 million a year that could be better spent on victim services or pursuing colder murder cases. Elliott points to the 24 people exonerated from Florida’s death row, the highest number in the nation—and one exoneration for every three executions—as evidence that the state’s capital punishment machinery is fatally broken. Among those exonerated: Seth Penalver, who was sentenced to die for the 1994 triple murder of a nightclub owner and two others in Miramar, until the Florida Supreme Court ordered a new trial. In December, Penalver was found not guilty on all counts, and was freed. Similar story with Herman Lindsey, who spent three years on death row for the murder of pawn shop clerk Joanne Mazollo in 1994. He was exonerated in 2006. On Saturday, Morelewicz, Egitto, Elliott, Penalver and Lindsey will all be at Santa Maria del Mar Catholic Church in Flagler Beach for a day-long community workshop entitled “Florida Death Penalty: A Broken System.” The panel will also be joined by Natishia Stevens, a regional organizer with the Florida ACLU. The workshop begins at 10 a.m. and concludes at 3 p.m., with an hour’s break for lunch, which is included in the $5 registration price. The workshop is the third in an annual series Morelewicz has been organizing with a dozen people from the church to “make our community and our church aware of social issues,” she says. Last year’s workshop focused on human trafficking, drawing 50 people. The year before a workshop on homelessness drew 80 people. The American Catholic Church is more categorically opposed to the death penalty (on the same ground that it is opposed to abortion) than the Vatican, which leaves a very small door open for executions in “very rare” cases, in Pope John Paul II’s words. “We the Catholic Bishops of Florida affirm the dignity of every person, both victims and offenders,” the Florida Catholic Conference of bishops announced last October. “We reject state sanctioned killing and ask the State of Florida to join the growing number of states who have rejected execution and enacted the option of life in prison without possibility of parole.” Ironically, the Catholic Church instituted the death penalty for heresy in 382, though the first incineration of a heretic did not take place until 1022. Last year Florida imposed 21 new death sentences out of 78 nationally, or more than a quarter of all death sentences in the country. The Jacksonville area alone—where the annual number of murders by firearm exceeds the annual number of murders in England–handed down a quarter of all new Florida death sentences. “The state picks up the tab, so areas like Duval County burden all Florida taxpayers with their extreme use of numerous, big-ticket death penalty prosecutions,” Elliott said in a news release last December, following Penalver’s exoneration. Since the United States Supreme Court reinstituted the death penalty in 1976 (after declaring it cruel and unusual punishment, in violation of the Eighth Amendment, in 1972), 1,320 people have been executed in the country, with an average of 50 executions a year in the last 10 years. Only China, Iran, Iraq and Saudi Arabia execute more people. But capital punishment has a long and undistinguished history in the United States as a whole. Colonial America, which had plenty in common with the modern-day Taliban in matters of capital punishment, imposed that penalty for perceived offenses such as idolatry, blasphemy, man-stealing, adultery with a married woman, perjury with intent to secure the death of another, the cursing of a parent by a child 16 or older, being a rebellious son, and any third-time burglary or highway robbery—all of which, with two exceptions, would not be considered so much as misdemeanors today. The workshop on Florida’s death penalty will be held at the Community Hall at Santa Maria Del Mar Catholic Church on Saturday, March 23, between 10 a.m. and 3 p.m., for a $5 registration fee. Contact Jackie Morelewicz by email here or by calling 386/569-0099. i’m puzzled as to why people are so concerned with murderers and very little concerned for the innocent victims. somebody should speak out for or protest for the dead. i wonder if they will protest in front of the mobile station on 100 where that mother was mudered in cold blood. Its not that we wouldn’t rather them dead. Its that WHO am I to take another persons life. Who is the STATE to say that you live or die. Its up to God to judge us. I got no sympathy for a person who commits violent crimes. You take the life of an innocent human who did nothing , then you must pay societies price for that crime. The majority of the ones who get another trail are still guilty only more lawyers and old evidence is no longer available. The murderous criminals know this and sit in prison waiting for their re-trial. These liberal loonies should spend their time helping victims and not murderers. I am confused as to how life without the possibility of parole saves the state $51 million vs. the death penalty. Paying for an inmate per day in the jail has got to be expensive. And I agree -not enough time is spent on these victims and their families. I don’t see how the system is flawed or broken if the innocent appeal and are found innocent – it worked! If they’re found guilty again by a jury of their peers, clearly they’re not as innocent as they want to think. The system isn’t as broken as the article describes. The system found those innocent people who were once convicted. The injustice was reversed. Fourteen years is no rush to find out if the conviction was just or not and forensics are better than ever now. The principle of punishment demands full payment for the crime. I agree with having the death penalty but there should be a judgement that the sentence is carried out in six months or a year.. Now it takes thirty years. The surviving family deserve closer..
R&R – Six months doesn’t allow time for appeals for capital cases. Those court procedures take years to work their way through the process in even non-capital cases. Restricting time in death penalty cases would be summarily executing people the same way they do in Iran, China, North Korea…not a club we want to be in. Stevie, you are assuming that the appeals process finds ALL of the innocent people who are convicted. The appeals courts are no more perfect than the trial courts – trial courts make mistakes and so do the appeals courts. I guarantee you that even with the appeals process, we are still executing innocent people in this country. MaryAnn, life without parole saves money because of two things – the extreme expense of housing death row inmates versus inmates serving life (it’s a totally different custody level, much higher security and therefore more expensive), and the expense of death penalty appeals in the courts. Defendants sentenced in death penalty cases are entitled to lengthy appeals to ensure that the constitution isn’t violated and that innocent people aren’t executed. Those appeals cost money, shockingly high amounts. ted bundy was a necrofile that literally slaughtered women. I saw him in starke in 1980 being led into the bradford county courthouse. i wanted to see his hearing for myself having grown up in north fla…he winked,toyed with and manipulated the legal system and looked around the courtroom winking and playing with the press and audience. he was on death row for eleven years and milked the legal system for all it was worth finally succumbing the the electric chair. he outlived some of his victims twenty years. for the opponents that pity ted bundy and say that the death penalty doesn’t deter crime, it deterred bundy from ever killing and murdering again. i’m quite baffled with this whole concept of saving these people. Justice isn’t about vengence its about fairness. The death penalty has never been proven as a deterrent to crime and exists only to make people feel good about themselves. 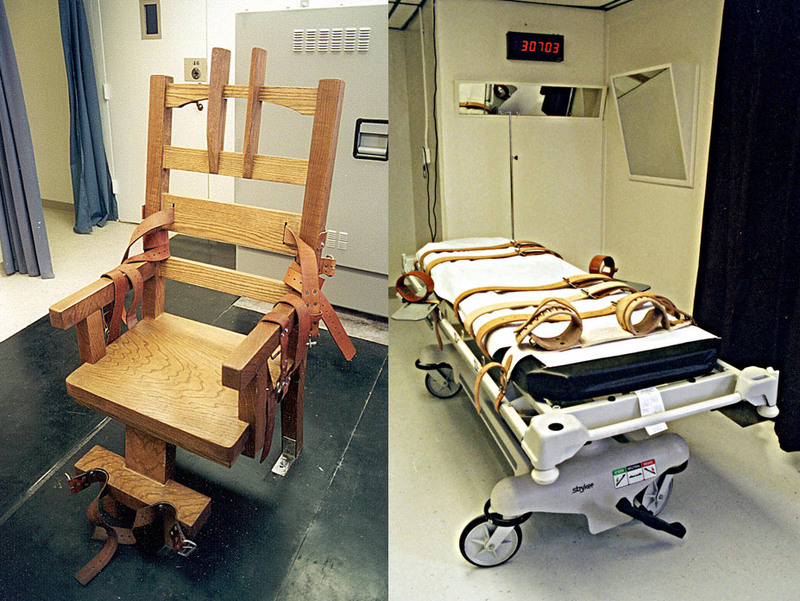 Civilized societies have outlawed the death penalty, time for the U.S. to do the same! What ever happend to…………do unto others…life for a life.. If someone were to murder one of my family members, I wouldn’t rest until justice was done. Why should someone get off, if they murder someone? You feel sorry for them? WHY? They knew exactly what they were doing when they did their dirty deed..
Then they let them live off OUR tax dollars for years n years, they have no obligations to anything, except live again, on our TAX dollars,,food, cloths, dental, heatlth, amities, money…!!!!!!!!!!!!!!!!!!!! If they did it, then they should pay the piper, PERIOD! GatorLover – you say that the death penalty deterred Bundy from ever killing again like that was the only way to make that happen. Locking him up for the rest of his life would have had the same effect. Why is there this persistent perception that if you oppose the death penalty, you must feel sorry for the murderer? I do not believe that the death penalty is morally right. Period. It has nothing to do with feeling sorry for anyone. I do not want the government killing someone – ANYONE – in my name, which is what they are doing when they execute someone in the name of “the people”. Killing is wrong. Two wrongs don’t make a right. You just compound the evil by killing for revenge. We’re supposed to be more civilized than the murderers. To me, the death penalty is like spanking your kid to teach them that hitting their sibling is wrong. Hypocritical. Add to that the significant risk of horribly injustice of executing an innocent person – even one is too many – and the cost, which is more than life in prison, and I see absolutely nothing good morally, public safety, or in any other way about the death penalty. Why does justice have to equate to an eye for an eye? We should be better than those that commit these offenses. It’s what separates us from them. Nancy N. The convicted person carried out an execution on the victim or victims with little or no notice. So what’s your point??? My point is that we should be better than those animals we are trying to remove from society instead of using their crimes as an excuse to sink to their level and become them, just with the self-righteous illusion that our crimes are more moral than theirs. i don’t think responsible tax payers should have to pay for the incarceration of murdering filth. people work hard for theiir money and are responisible for the children’s well being and maintaining a roof over their head,clothes on their back,shoes on the feet, and medical care. having to support this vile trash in a prison system for 40 years is ludicrous as welll as this comfy sweet little lethal injection thingy we have now. bring back the electric chair and soon. Like I said before 6 to 12 months after conviction is plenty of time to pull the switch.. Those of you who get on your soapbox and preach morality would sing a different tune if it happened to you or your family.. These people are animals and and should be put down..
Why is there always this blanket assumption among supporters of the death penalty that if someone you love is killed you absolutely must want the perpetrator to receive the death penalty? Many families of murder victims oppose the death penalty. Families of murder victims helped get the death penalty appealed in Connecticut, and are advocating against it in other states as well. Check out a group called Murder Victims’ Families for Reconciliation. In most cases where they oppose the death penalty, victims famiiles’ say that the capital process lengthens their emotional upheaval over the events and that they would like to see the money spent on the capital process spent on assisting victims. Nancy you’re out of touch. What do you do with dogs or animals that attack people? YOU PUT THEM DOWN.. The people that murder ARE ANIMALS.. Get a grip and deal with it..
Wow, you people scare me. People are not animals. I’m with you Nancy.